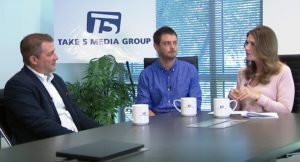 Take 5 Media Group, one of the nation’s largest consumer data owners and compilers, and a leader in omni-channel marketing solutions, has released a new webinar explaining the effectiveness of geo-fencing, a GPS/RFID technology, as a digital marketing tool for reeling in potential customers within a defined local market. The webinar may be found at https://take5mg.com/geo-targeting-webinar/. Other Take 5 webinar topics include innovative approaches to content and social media marketing. The newly released webinar, entitled “Building Virtual Perimeters Around Your Customers,” is designed to foster understanding of the new technology and its potential as a marketing and sales tool. Geo-fencing consists of creating an electronic perimeter around a defined area in which consumers on mobile devices with internet access are served ads and promotions directing them to a nearby business. Perimeters are most effective up to 15 miles, with a two-to-five-mile radius typically considered ideal, depending on the area’s population density. Some sales environments are particularly well suited to geo-fencing. Tradeshows and conferences, for example, are ideal venues for using geo-fencing to drive attendees to sales booths. Brick and mortar stores can serve digital ads to people walking down the street and entice them to stop in. Creative strategies may include building geo-fences around a competitor who is having a big sales event and enticing shoppers within the perimeter to visit your business instead and take advantage of special promotions. Experienced marketers know there is no silver bullet for engaging consumers and generating sales. Geo-fencing is no exception. This intriguing tactic is most effective when used as part of a multi-touch digital campaign that includes email, social media marketing and ad display retargeting. Founded in 2003, Take 5 Media Group is a nationally recognized compiler of double opt-in consumer participation. The company’s headquarters are in Boca Raton, Fla. with branch offices in New York City, Atlanta, Ga. and Modiin, Israel. Take 5 is now part of Advantage Solutions, a $4 billion global brand development company based in Irvine, Calif., providing sales, marketing and tech solutions to brands and businesses. For more information, visit www.take5mg.com.